In my previous article, "When can you retire on dividends", I introduced the idea of the dividend crossover point. 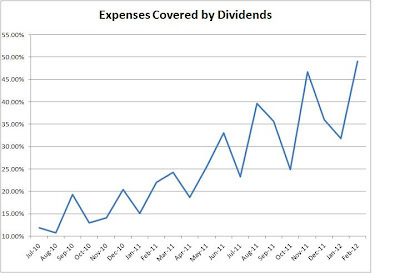 This is the point where your dividend income meets or exceeds your expenses. For many dividend investors, this is the point synonymous with financial independence. After all, after years of sacrifice, wise investment and sticking to a plan, investors would finally be able to do be free from a nine to five job. In order to reach that magical point however, a lot of work needs to be done. Investors need to design a retirement strategy, and then stick to it through thick and thin, while also improving along the way. Some of the biggest dangers to successful dividend investing are not market volatility, dividend cuts or recessions, but investor psychology. The process of accumulating a viable dividend stream will take anywhere from several years for those who are starting out with a large amount in their 401K or ROTH IRA’s to several decades for these young investors who are just starting out in their professional careers. Along the way, many investors will lose track of the goal due to sheer boredom or due to lack of patience. Successful dividend investing is sometimes as exciting as watching paint dry. Unfortunately, investors who enter dividend investing for the sheer excitement, do not stick to it. On the other hand, investors who attempt to find shortcuts to speed up the process of capital accumulation by using options and futures, risky growth stocks or massive leverage will likely be disappointed along the way. The key ingredients to accumulating a sufficient dividend income stream include time, dividend reinvestment and regular contributions to your portfolio. The power of regular contributions is important, because this ensures that investors consciously keep working towards their goal of dividend independence by investing in dividend stocks every month. While markets fluctuate greatly, I have always found at least 15 – 20 attractively valued income stocks at all times. Dividend reinvestment in dividend growth stocks is essential for turbo-charging your passive income. And last but not least, investors need the time to let their income compound to their desired amount. Dividend investing takes time, before the amount of distributions reaches decent levels. Imagine that someone managed to save $2000/month for one year. Each month, they put $1000 in two stocks. At the end of the first year, they would have about 24 companies, and the portfolio cost will be $24,000. If the average yield were 4%, this portfolio will generate $960/year in dividends, which accounts for roughly $80/month. On the positive side, the dividends from this portfolio will generate enough to purchase one additional stock position per year. In addition, $80/month could pay for utilities, phone or internet bills for the investor pretty much for life. On the negative side, assuming that the investor needs $1000/month to cover their basic expenses, he or she would calculate that they would need to sacrifice almost for one decade, before their income reaches a decent amount. Once they are there however, and their portfolios consist of wide-moat dividend champions with sustainable distributions, investors will be able to live off dividends. Over the past two years, I have gotten been able to get closer to my target dividend income goal. I am not including an actual number here, because my number would not be relevant to other investors. Different investors will have different target monthly incomes – for some $1,000/month is sufficient, whereas for others even $10,000/month will not be enough. Over the next few years I will be consistently able to meet at least half of my monthly expenses with income from my dividend portfolio.